Dry foot skin (hypohydrosis) is common and can occur in men and women at any age. The skin is naturally moistened by its own sweat and oil glands, which function more during the warmer summer months. These glands purpose is to release heat through sweat and keep the skin soft and healthy. When sweating is not required frequently, such as during colder weather, these glands are not as active, and the skin becomes dry. The skin can also be dry as a result of simple genetics, as some people simply have dry foot skin, or even thick callused skin spread over the entire bottom of the foot. Others develop dry skin as a result of diseases that affect the nervous system that controls sweating and gland production, such as diabetes. Dry skin in the feet can be a simple nuisance or can lead to significant foot problems. Simple cases of dry, flaky skin merely feel and look rough, and are mostly a cosmetic and minor comfort concern. As this increases, the risk of the skin cracking and splitting becomes greater. When the foot skin cracks, pain develops, especially when the cracking is on a stress area. Bacteria can also enter the skin at this point, posing an infection risk. When the cracks worsen, especially on the heels, bleeding can begin, leading to significant pain. In diabetics and those with compromised immune systems, these cracks can pose a significant risk for a serious foot infection, as well as lead to chronic wounds. Self-treatment of dry skin is easy to perform but simply requires daily discipline for the best results. The skin needs to be moisturized at least daily, with drier cases needing twice-a-day moisturization. The entire bottom of the foot should be treated, as well as the top of the foot if that is dry as well. The spaces between the toes should be avoided, as excessive moisturization there can lead to fungal infection. The best moisturizers contain urea or lactic acid, although not all cases of dry skin need such compounds. Water-based compounds and glycerin compounds are also commonly used in lower potency moisturizers. Severe cases of dry skin may need a combination therapy of powerful moisturizers, skin protection with gel padding, and the regular use of an emery board or pumice stone on rough, thick areas. 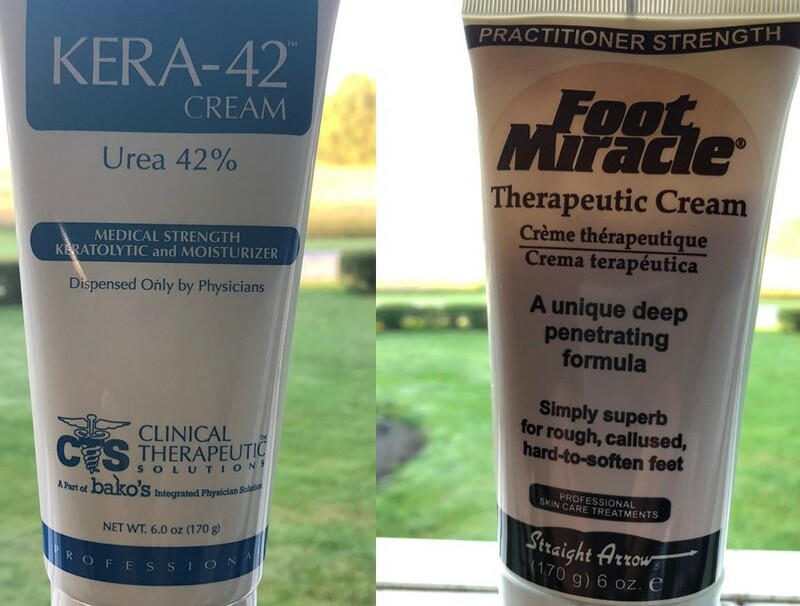 Our offices carry a premium general moisturizer called Foot Miracle Cream, as well as a potent product called Calicylic Cream for cracked skin and rough calluses. Both products are well regarded by our patients and doctors alike for ease of use and effectiveness.